On November 24th 2015 Turkey shot down a Russian SU-24, because it had violated Turkey's airspace. 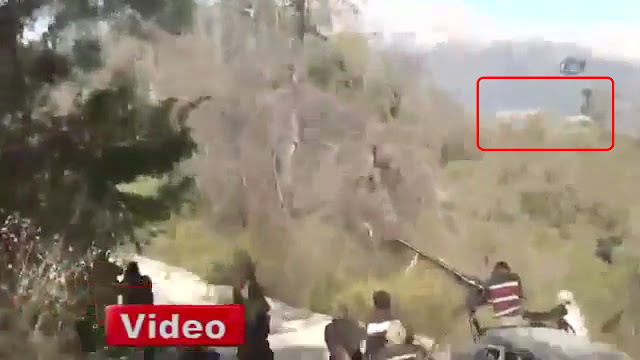 On the same day a video was released of rebels destroying a Russian MI8 helicopter with a TOW. 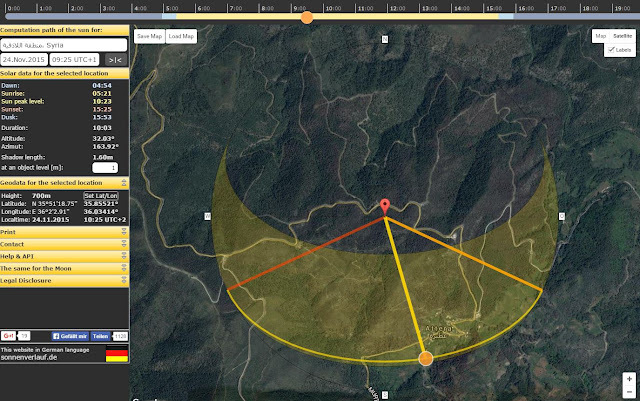 In this blog we'll geolocate the videos and crash sites. The bridge is likely for a train. A highway-bridge would be much larger. Following that railway in Google Earth, we can see there are two bridges that look like the one in the video. Bridge #2 matches the situation seen in the video. Now we determine the approximate angle and direction of the camera in that shot. We can simply draw a line in GE starting at the bridge at an angle and look down that line to see when and where the shot matches. Red circle = parked helicopter. We look at the backside of the heli and on the right side we can see the wall almost in line with the view. It means we can draw a line on GE again into that direction. Along that line the TOW-position must be found. Furthermore the sound of the TOW starts at 1:22 and the hit comes at 1:33. That's after 11 seconds. From wikipedia we can learn that a TOW travels at max 278-320 meters per second. So the distance should be max 3-3,5 kms. Since this point of view is EXACTLY in the opposite direction of camera two in the ANNA video, it might very well have been possible that they filmed this location. 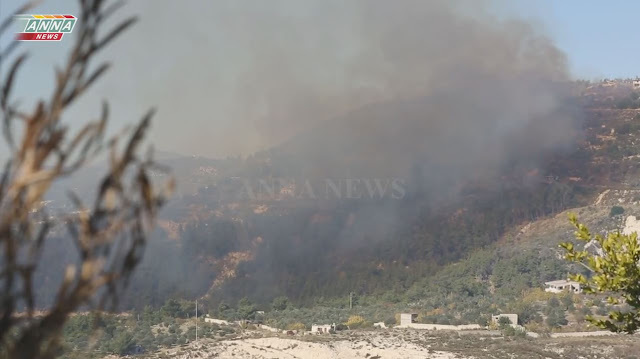 Then we draw a line starting from the camera position towards the smoke plume (blue line). 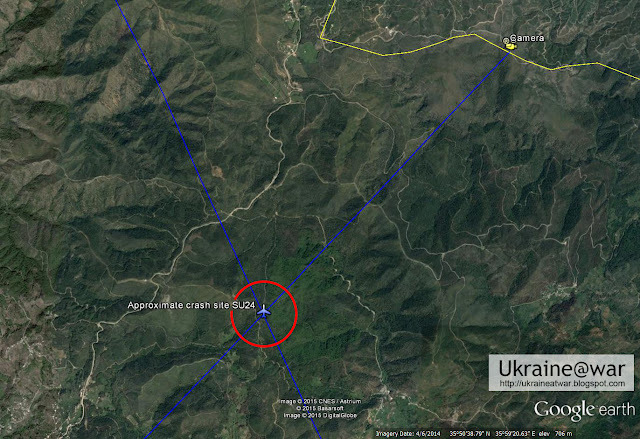 It simply means the SU-24 must have crashed somewhere along that line. 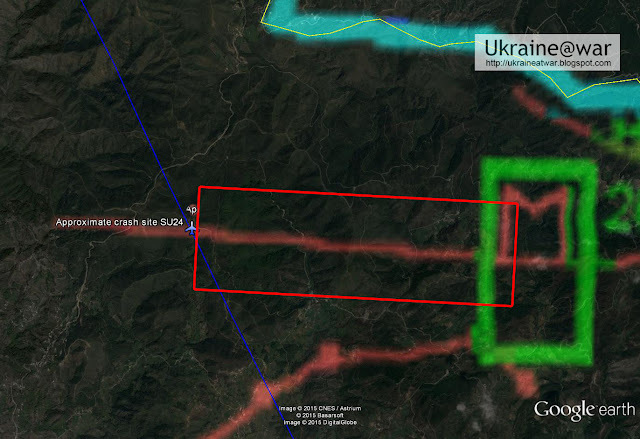 IF... the Turkeys data is correct, we now have a rather narrow area where the SU-24 might have crashed. It is not even THAT difficult, because most point of views don't look like this AT all. One hint that helps to narrow it down is that the smoke plume seems to drift to the right, whereas in the ANNA video it drifted to the left. It means this was filmed from opposite direction. And also the rebels firing at them and capturing (at least) one, must have been somewhere around there. It seems as if they are on a road and looking at the treeline left of the road. And they are on a slope that's going upwards facing the jet path. But now we can see that there is a road at the RIGHT side of this tree.Could there be double parallel roads? Either they are on a turn there, or at some crossing. We see the parallel 'roads/lanes, the 'crossing', the trees etc. So this must be the spot. 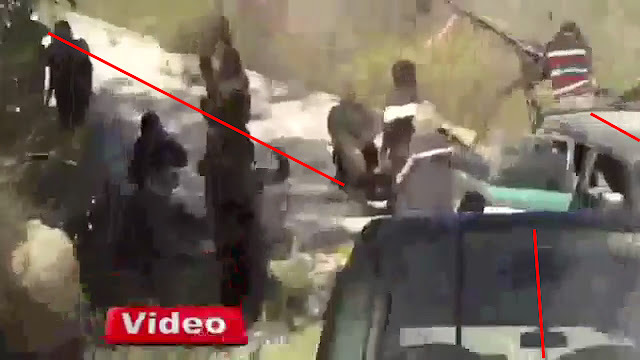 In one of the screenshots above, a rebel is lying on the road, shooting at the pilot. He is in line with the road. That gives us the direction of one of the pilots. He is more to the left. We need to find a piece of road where the direction of the yellow line falls at an angle as seen in the screenshot. This location matches all the features seen in the video. 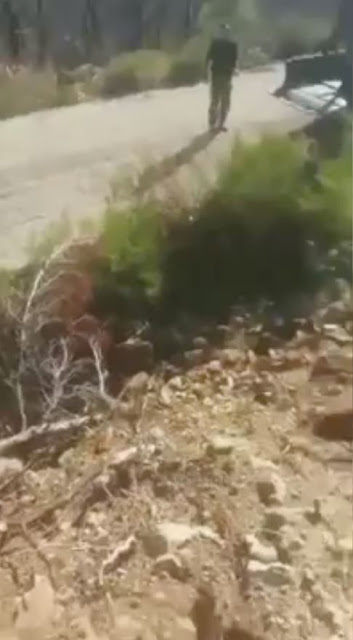 Whether the pilot landed at that location, or if he was brought there is not clear. 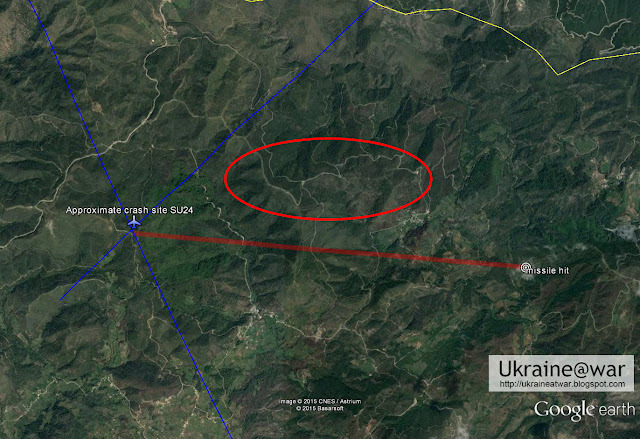 With a very high degree of certainty we have determined the SU-24 crash site. This is in line with the Turkish data. It shows the Russians have been lying about their route. The Russian crash site is nowhere in sight here. With the Turkish data being correct, it also shows the Russian planes INDEED have been violating Turkish airspace. Without ISIS, the world would simply want to take out/remove Assad. And it might have done so already. It says: "Extremists from Syria and from around the region start travelling to Syria to join the rebels. Assad actually encourages this by releasing jihadist prisoners to tinge the rebellion with extremism and make it harder for foreigners to back them." Russia & Assad do not want to take out ISIS. It is a divide-and-conquer-strategy. Keep the parties divided and thus you can rule all of them, including the West. Understand that Putin has been a KGB-officer for 16 years. It was also during HIS service that the KGB invented/promoted International Islamic Terrorism. As a president he has learned from Chechnya that you can better pay terrorists to work for you than to fight them yourself. In Donbas Ukraine he has sent thousands of Chechen Islam Terrorists/mercenaries to fight his battles and die for him. All sent by his ally Kadyrov. It is really incomprehensible that Western political leaders want to do 'business' with Putin. The Kremlin is mafia. Russia benefits from conflicts in the world. Selling oil and weapons are their main source of income. They invaded Ukraine and annexed parts of it and they are not finished yet. They do the same with other neighbours. They keep butcher-Assad in the saddle so the Syria-conflict cannot come to an end. Russia is the State Sponsor of International Terrorism. How can you ally with this man? His air raids in Syria are targeting markets, hospitals, schools, a bread factory... all this to make the population flee to Europe. He uses refugees as a weapon in a hybrid war against Europe/America. Destroying a #hospital in Hader, a school in Maaret Al Numan and a bakery in Atareb....this is how #Russia is fighting #terrorism in #Syria. And now Hollande wants us to work with him against ISIS? With Hollande planning to meet Putin in Moscow next week, #Russia moves from strategic problem for Europe to an ally after #ParisAttacks. ISIS is a monster created, fed and manipulated by Assad/Putin to fight the West. Putin does not want it to get killed.
.@RT_Erdogan live at #ACsummit on the symbiotic relationship between ISIS & the Assad regime: "You would have to be blind not to see it." This caught him off-guard. In any other situation (such as TU154 with Polish government - "it was the pilot" , MH17 - "it was Ukraine", Total CEO Margerie - "it was drunk driver") Putin/the Kremlin had immediate/solid answers to what caused these tragedies, whereas the Dutch took a year with thorough investigation before coming to conclusions regarding MH17. With the A321, it took Putin two weeks before he gave a response. It means it must have caught him by surprise. Now, with the Paris-attacks Putin suddenly knows: it was ISIS. The French and Russia have common enemies now. Hollande falls for this trick. And possibly a lot of other Western politicians too. What Putin would really want, is to draw the West into a larger conflict with Islam. He wants the conflict in Syria to grow faaaaaar beyond its borders... meanwhile manipulating behind the scenes and having Russian territory itself staying out of the conflict zone or even growing by taking more pieces of its neighbours, all unattended by the West who is busy dealing with 'their own' (Putin created) problems. Since the first part of July 17th was sunny and only later clouds appeared, it is possible to calculate (approximate) times based on shadows. Maybe that will bring some clarity. A very handy tool to do this can be found on www.suncalc.net, but this one does not give LOCAL time. Another one can be found at http://www.esrl.noaa.gov/gmd/grad/solcalc/. That one needs some good-old-handwork, but has more precise time-control. For Ukraine the timezone is UTC +2 and DST (Daylight Saving Time). Calibrating Suncalc.net with this, we need to add +1 hour to get the correct Ukrainian local time. This can be understood as follows: suncalc.net uses the time of the users computer or even its own server. Since that is in Europe and the time difference with Ukraine is one hour, one hour needs to be added to get the local time. As reported in this blog, the BUK on the loader had been spotted on Illicha avenue. Buryat reports the BUK is in Donetska nd came with a crew. Khmuryia says it won't be hidden but will be used immediately. Buryat says he only had one instead of two. Khmuryi says it will go with Vostok tanks. 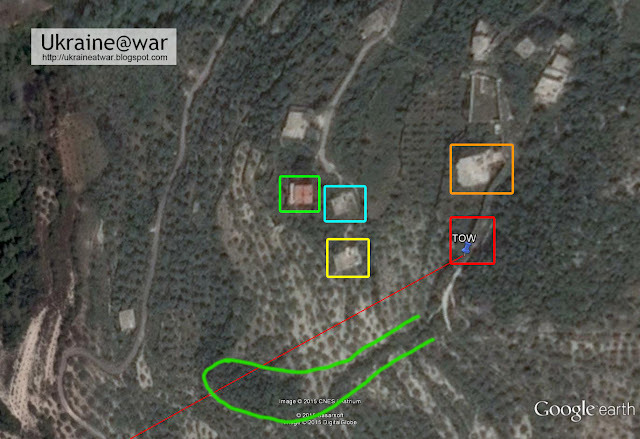 Khmuryi asks where the BUK should go so it can join Sanych. "Behind the motel, just before Hornostaevka," says Sanych. "Just behind the motel," confirms Khmuryi. Khmuryi instructs Unknown that he can find the BUK "outside the Motel roundabout". He has to take as many men he needs to accompany the BUK and go to Pervomaiske where he will be a reserve and has to guard the BUK.. 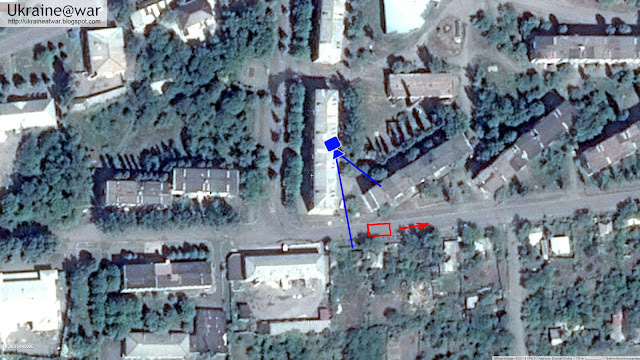 Since in the third phone call instructions are given to put the BUK "behind the motel", at that time (9:23) it still must have been at Illicha avenue. In the fourth phonecall Khmuryi says the BUK can be found "outside the Motel roundabout". It means it had relocated to that location (where Paris Match spotted and photographed it) by 9:54. This photo does not give a lot of foothold to work with. Intuitively I would say the shadow of the cabin bends slightly forward and thus the sun coming slightly from the back. But intuition is not enough here. The big question is: what line is perpendicular to the street? If we can find that, we can review the shadows relatively to this line. But it is almost impossible to find this line, because there are basically no footholds to start from. the pole in the middle does not seem to be vertical? But is the left one vertical than? Without definite vertical or horizontal lines it is impossible to find the horizon. the road may slightly bend downwards to the side where the truck is standing, thus giving a shadow that is a little bit off. the photo seems to be a crop from a video. If we don't know the center of the original photo, it is hard to tell what lines go perpendicular on the road (to compare the angle of the shadow with). The left side is the shadow side and similar to this left side, the back side is in shadow too (all the red arrows). But there are some features sticking out and receiving sunlight, similar as the top (yellow arrows). The big square (where a window could be placed) is at the top and left a little bit lighter than on the bottom and the right. This is also because it is bended slightly, but the point is: it does receive a little bit of light, but is NOT in full sunlight yet. Assuming that the truck is parked almost exactly in line with the road, it means the light must be coming almost perpendicular to the road and slightly forwards from the truck. The problem is, if they get one thing wrong (at first), how sure can we be about the other thing? Their "11 am" probably is not meant to be very accurate anyways. It might have been 10 minutes before or after. So I think even we might say that their reported time might have been between 10:45 and 11:15.
the suggested shadow-calculation is totally wrong and the reported time was right. the reported time is wrong and Suncalc-time is right. There is one small possibility how the reported "11:00" still could be right... if the journalists had their watches on Moscow time, which is 1 hour later than Ukrainian time. 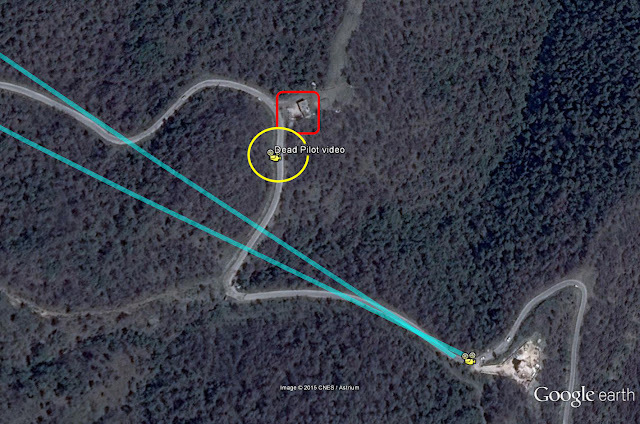 Since the BUK arrived at this location just before 9:54, it has either been waiting there for some 15-20 minutes (scenario 2) or about one hour (scenario 1). Nevertheless this means the Paris Match photo must have been taken before 11:08, because the BUK is not on it's location there. With an average speed of 40 kms per hour it should have left before 10:50. It means if we can be a bit flexible about the "11:00" the BUK-loader could have left between 10:45 and 10:50 to (just) get out of satellite range in time (scenario 1). In scenario 2 the BUK-loader would likely have been long gone when the satellite took the picture. 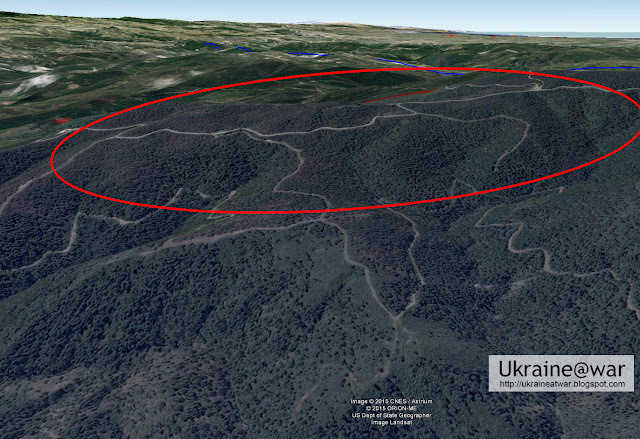 Red ellipse = road hidden by trees in front of Vostok base. The shadow of the pole runs over the path which is a little bit lower than the area where the pole is. Therefore the shadow is curved. The yellow line syncs with the part going down and therefore is not correct for getting the time. The red line syncs with the part running over the path and is more suitable. Since there is a height difference, we can not draw a line from where the pole hits the ground. We have to start drawing this line from where the pole WOULD hit the ground if it was at the same level. This is approximately indicated by the red line. We can see it runs a little bit in front of the tree. It' s about 11 kms from the Vostok-base which may have been between 15-30 minutes driving for them. They might have left the base something after 10:00 am. So WHILE the BUK-loader had just arrived (before phone-call of 9:54) and was waiting at the 'Motel' location, the Vostok convoy started leaving! 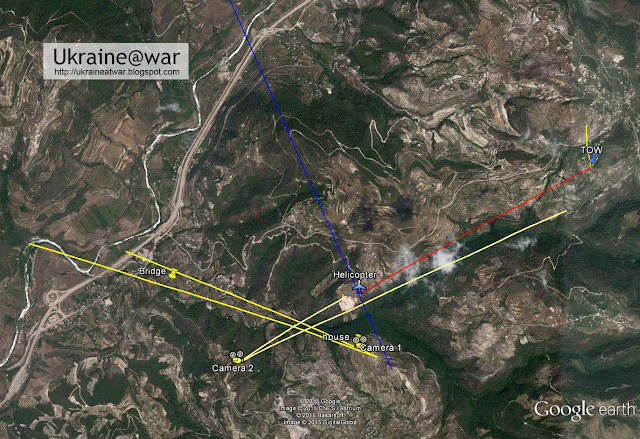 Scenario 2: the BUK-loader likely had left at (almost) the same time as the Vostok column. Waiting at the wrong location? Maybe... the BUK-crew stopped and waited at the wrong location? They HAD to go to the Vostok-base and stop 'after the Motel just before Hornostaevskaya' which is the entrance street to the Vostok base. Did they instead stop 'just after the Motel' and thus missed the leaving convoy? Maybe there and then they decided to let the tanks go ahead and have the BUK catch up with them? Or maybe they thought the BUK was already driving and the tanks had to catch up with the BUK? The time reported back then was 11:40, what thus turns out to match with the suncalc time. Google maps gives a distance from the Motel-location of 36,7 kms. It means if they left from the Motel at 10:45, they arrived at Zuhres after 55 minutes, the average speed was 40 kms/h. With this speed it would take them 18 minutes to travel the 12 kms to get out of range of the satellite and they would be out of range at 11:03. 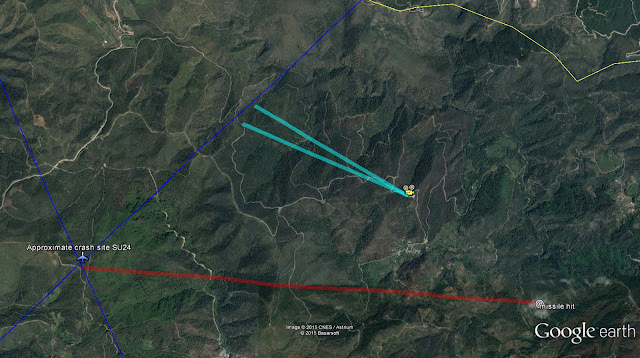 This shows that if the BUK would have left at 10:55 (AND if would not have driven much faster during this first part) it couldn't have escaped the satellite. But leaving at 10:50 it would. An average speed of 44 kms per hour does not seem completely impossible for the loader, but it is on the high side. scenario 1: the BUK-loader would have to drive an average speed of 40-45 kms/h, which might be too high for such a heavy trransport. scenario 2: no problemo; time enough even at low average speed. That last entry shows that if the BUK was hidden at the Vostok base and had immediately left after the satellite was taken, it had to drive with an amazing 73 kms/h average to arrive at Zuhres at 11:40. That seems to be too much. Therefore we should exclude the option that the BUK is somewhere hidden on the satellite. We must conclude that it was already out of range when that image was taken. It is tempting to start the first point at the exact corner of the apartment building. But since this satellite image is taken at an angle, the top does not give the exact position of the building on the map. The BOTTOM does though. So we have to correct the starting point with the same amount and angle of the other side of the building (because we can clearly see it there). This is indicated by the small red line. To prevent errors like this one should find a satellite image taken EXACTLY from 90 degrees above. Next we extend that line along the left side of the blue building (blue circle) until it hits (again the bottom!) of the other apartment building. THAT's the position of the cameraman. From there we draw the other two verification lines. One goes through the big pole (small green circle) and we can see that the bush further on is on the right side of it (larger green circle). The other one goes through the larger pole (larger orange circle) and we can see that the smaller pole in front of it is a little bit on the right side of the line. Thus this confirms the cameraman position is correct. Again take care to draw the upper line through the BOTTOM of the building (extending the previously drawn line is the easiest way to do that). 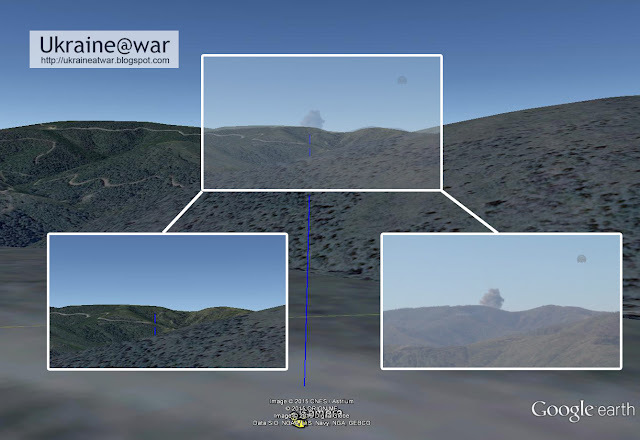 With Google Earth we can now measure the distance between those two points: 28,73 meters. The video I downloaded had 29 frames per seconds. This means the loader traveled some 29 meters in 4,3 seconds, which is at a speed of 24 kms/h. Scenario 1: This calculated speed does not come near to the 40-45 kms/h average speed we calculated earlier. The only thing we can say about this is that at this point the loader is driving uphill and thus must have significantly slowed down here. Scenario 2: if the BUK-loader would have left the Motel-location at a similar time as the Vostok column, say 10:05, it would have had 1 hour and 35 minutes to travel the 36,7 kms to the Zuhres-location. The average speed would be 23 kms/h. Exactly what we see in the video too. And then extent a line along the shadow of the pole (white line). Now the problem is that their is a slope on the field before the pole. That makes it very difficult/impossible to compare it with the lines of the field. But assuming that the roof of the shed is horizontal and even approximately pointing into the direction of the pole, we can extend a line from there (blue line). This blue line represents a line perpendicular to the path near the pole and by chance also happens to represents the 11:40 time. As can be seen, the white line is at an angle to the right of the blue line, meaning it was (a little bit) earlier. According to this calculation the truck might have passed this position somewhere between 10 and 30 minutes earlier than the loader. Scenario 1: the loader had been (or is) catching up with the rest of the convoy. Maybe the Vostok convoy had been waiting for the truck or they were driving very slowly. Scenario 2: the BUK-loader is falling a little bit behind from the Vostok column or they had been driving a little bit behind all the time. but the left/back side has shadow (small red circle). The same accounts for the others (yellow ellipses). That means the light comes slightly from the front. This screenshot shows that the side of the stone we are looking at, is having/getting a shadow (in right half of red circle compared to very bright in left half). The distance from the Zuhres location to the first Vostok location is 16 kms. Assuming that the truck passed Zuhres 10 minutes earlier than the loader (thus at 11:30), they traveled with an average speed of (16 kms in 55 minutes =) 17kms/hour. This is unlikely slow. The only good explanation for this is that they must have taken a break to prepare for the video they were going to shoot and thus stopped the convoy. Meanwhile, even if the BUK was 10 minutes or more behind at Zuhres, it should therefore TOTALLY have been catching up with Vostok at this point! But why was it not on the Vostok video? Either it must have been waiting behind them further down the road so Vostok could shoot their video. Or it even PASSED the convoy and drove UP FRONT of them. Whatever the situation was, it seems they deliberately did not want to have the BUK on the Vostok video! we can see that the shadow on the billboard is at an angle, indicating sunlight hits the billboard from the right (left red ellipse). At the car on the right we can also see that the shadow is left from the car and thus the sunlight comes a little bit from the right side. 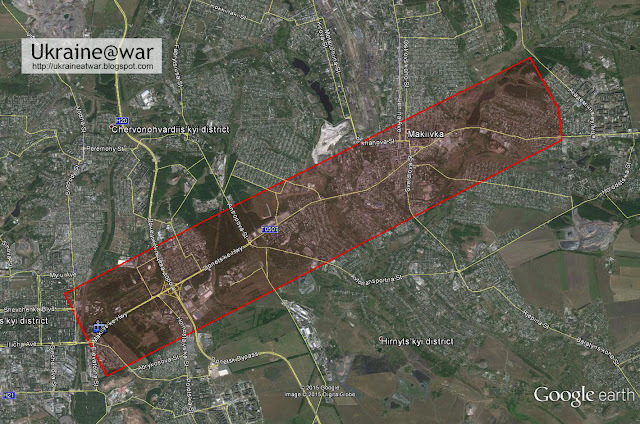 At 12:16 @Wowihay tweets that a BUK is driving through Torez in the direction of Snizhne. 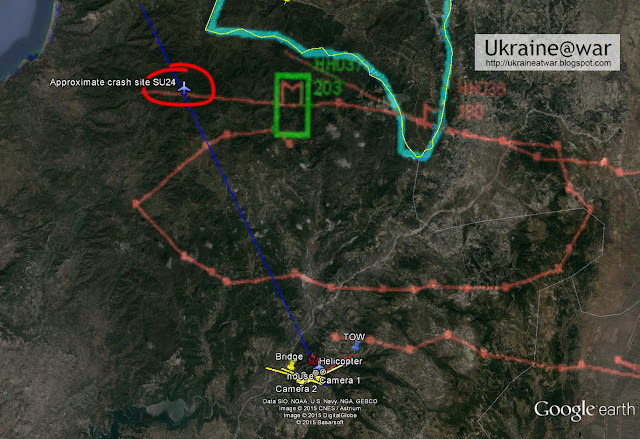 Do note that this is BEFORE MH17 was taken down and thus before anybody knew it was a passenger plane and thus before Russia/DNR tried to blame Ukraine for doing this. At 12:26 @MOR2537 tweets a similar message. It seems this "12-10" should be understood as the time 12:10. It can't mean anything else actually. These times mean that the loader had PASSED the Vostok convoy before they started to film it and was waiting here in Torez while they were filming. The shadows are less profound in these videos, making it much more difficult to find an exact time. This screenshot shows that the light clearly comes from the left and the shadows of tank and car are projected to the right. But at what angle exactly? I have the impression that the light comes a little bit more from behind than from the front. To be safe we should maybe say that the time was somewhere between 12:30 and 13:30. A green truck can be seen behind the white van, as well in the Vostok video as in the RT- video. Thus it seems the Vostok convoy traveled the 9 kms from one to the other location (meanwhile passing the place where the loader was parked) without stopping. This would be a 10 to 20 minutes drive with an average speed between 25 and 50 kms per hour. Because Vostok filmed their last scene about 12:40 or a bit later, they could have passed the RT-car between 12:50 and 13:00.
before it drove to it's final destination. 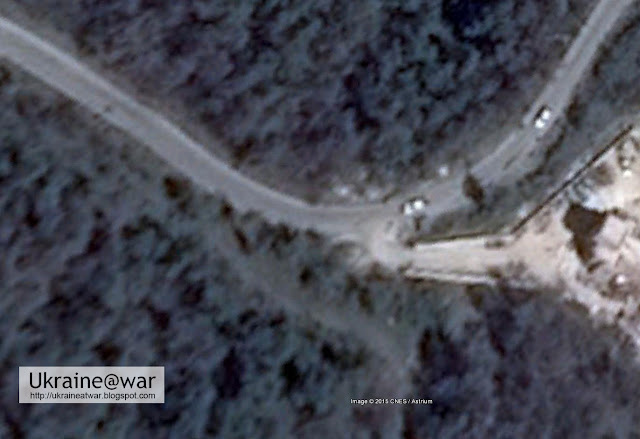 Google Earth shows that there is a blockpost there, with extensive trenches behind it and lots of space to park tanks and unload the BUK. Maybe they used the third abandoned gas station area (at the left) for this. 7 tanks is more then the 3 tanks we've seen in the Vostok convoy. These other four seem to be (arriving?) 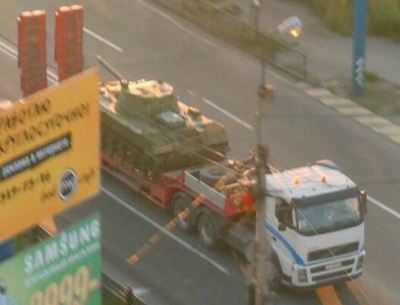 Oplot tanks who where later heading for Donetsk. The bottom one is exactly on the spot where the BUK was photographed and where retired miner Sakharov said it was parked: on Karapetyan street (red mark). So it seems obvious to conclude the journalists were having lunch there when the BUK drove by and parked (almost) in front of them (but it could have happened in one of the other restaurants too of course). One of the guards seeing the journalists makes sure they didn't film it. Take note: THEY DIDN'T WANT THE BUK TO BE FILMED!! It means they didn't want Vostok or RT to film the BUK either. Maybe they did that anyways, but just didn't publish it. It is a good explanation of why the BUK is not on the (Russian made) Vostok videos. It is a 12 kms drive for the BUK-loader from the location in Torez where it was photographed (at about 12:25) and Karapetyan street (at 13:05). With an average speed of 25 to 50 kms/h this is a 15 to 30 minutes drive. This would give it 10 minutes (at it's slowest speed) to 25 minutes (at highest speed) to unload (near the gas station). An average speed of 35 kms/h with 20 minutes for unloading does not seem to be unrealistic at all. 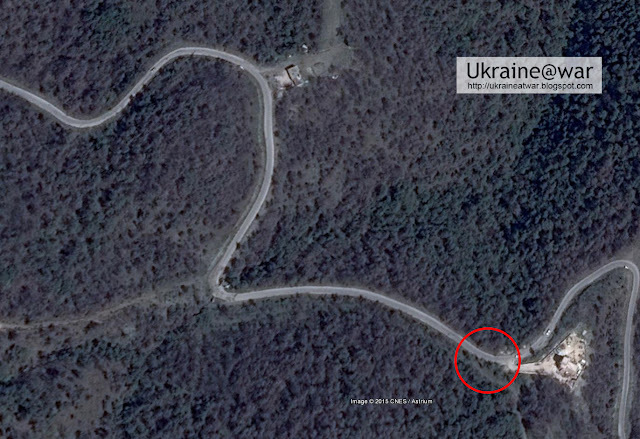 But that DOES mean the BUK-loader must have left its parking spot in Torez quite quickly after that photo was taken. 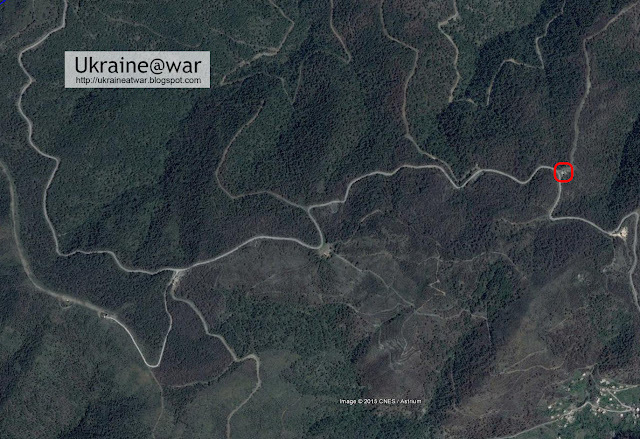 And after some 5 minutes (that is 12:30) it would pass the location were RT filmed Vostok (between 12:50 and 13:00). THAT means the BUK-loader was driving AHEAD of the Vostok convoy. In the tightest scenario RT filmed Vostok at 12:50 and Vostok had 15 minutes to arrive at 13:05 in Snizhne. But by that time the BUK was already unloaded and at Karapetyan street. So the BUK definitely must have arrived earlier than Vostok. It seems they had been waiting for Vostok a while, but Vostok took way too much time to take their video, so they decided to move on with Vostok catching up with them. It indeed means the BUK had been parked there for some time (10 to 20 minutes), just as retired miner Sakharov had said. Tricky thing is the road goes up there, meaning the real angle (shadow created on a flat area) should be slightly more horizontal in this screenshot. 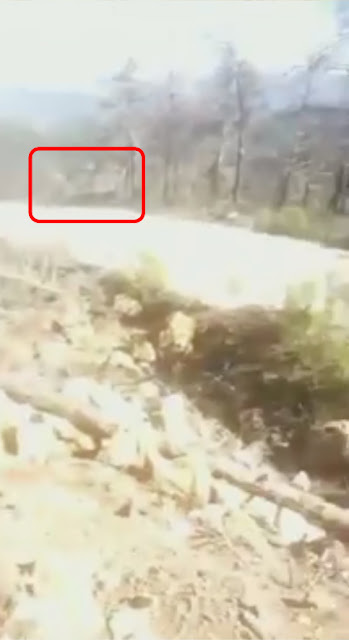 As shown in this blog, the Oplot tanks were driving TOWARDS Donetsk. No clear shadows are visible in those videos. It means the weather had turned cloudy, blurring the shadows. Thus these videos must have been recorded late in the afternoon. 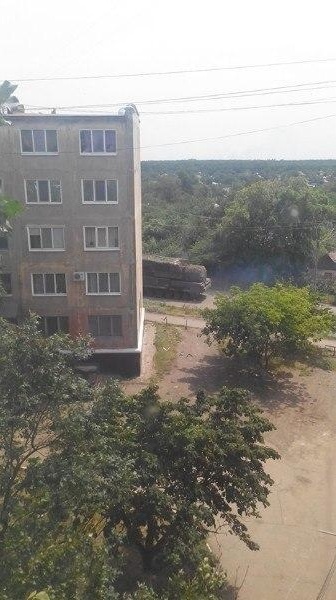 Around 9:00 the BUK-loader arrived at Illicha avenue in Donetsk. A couple of telephone calls back and forth were done to determine what to do with it. At 9:23 it gets instructions to go "behind the Motel" and before the Vostok-base. Instead it drives just behind the Motel roundabout and not at the entrance of the Vostok-base. Something like 10:45 Vostok leaves its base, but not finding/taking the BUK-loader with them. The BUK-loader left it's Motel-location 1 hour after the Vostok-convoy had left the base. Likely between 10:45-10:50 driving with an average speed of 40 kms/hour in the first part. They were just getting out of range of the satellite that made an image at 11:08. By the time it got in Zuhres it had catched up a lot with the Vostok convoy. There were some 10 - 30 minutes difference left. The Paris Match journalists must have been mistaken about the time they reported. Maybe they reported 'Moscow'-time, which is one hour later. By the time the satellite made the photo is was long gone from that area. The BUK traveled with an average speed of 23 kms/h in the first part. Vostok wanted to make a video by the time they drove out of Shakhtarsk towards Hirne. 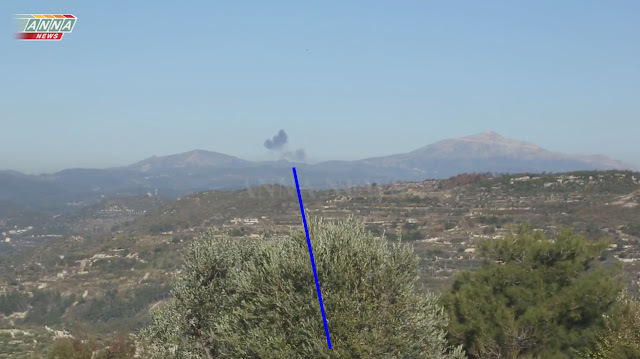 They stopped somewhere over there and had the BUK-loader pass them, (so it would not be recorded on the video). In Torez the BUK-loader waited a while (for Vostok). They must have arrived at the gas station in Snizhne at about 12:40, where they had 15-20 minutes to unload. At that same time Vostok shot the last scene of their video and they (quickly) moved on from Hirne to catch up with the BUK. RT recorded them on the road from their car just before 13:00. 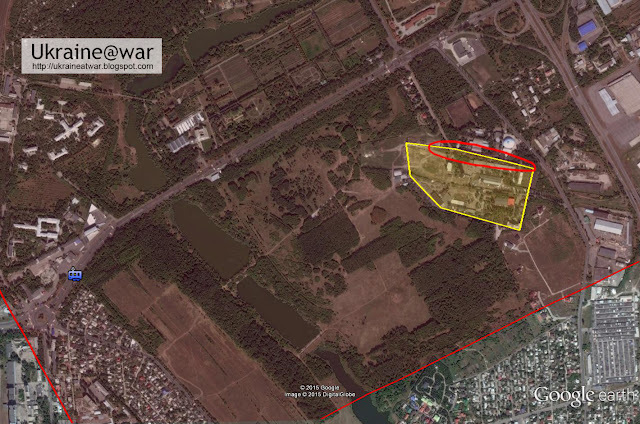 Unloaded, the BUK already had left towards Karapetyan street, (probably because it would be more out of sight there, than at the gas station). Some AP journalist where having lunch in Snizhne and got a big surprise: a BUK drove by and stopped a little bit further. Meanwhile Vostok arrived at the gas station, finding the BUK was already unloaded. 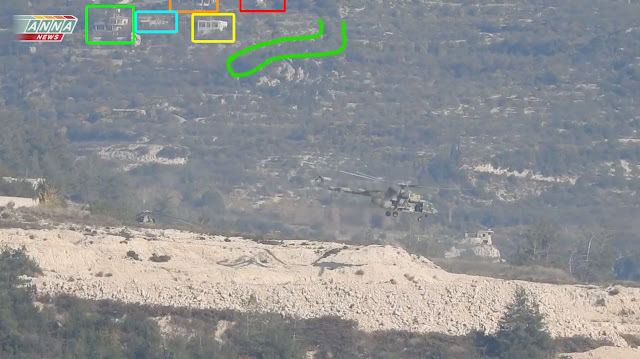 4 Oplot tanks had also arrived there (freshly coming from Russia?). When the AP-journalists drove to(wards) Donetsk they saw the seven tanks at the gas station. By that time the BUK was already positioning at it's launch location. 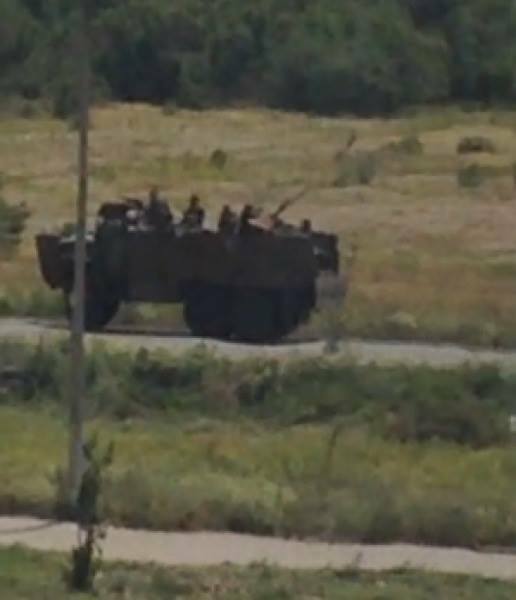 The Oplot tanks moved on and drove to Donetsk where they got spotted and filmed. Neither of the two scenarios can be completely excluded as impossible. But the "11:00" does seem to be more troublesome. Why did it wait for one hour, to rush towards the Vostok convoy, narrowly escaping the satellite with a stiff average speed for such a heavy transport and basically not travelling together with Vostok. The "10:00"-scenario on the other hand fits a lot better. Suncalc seems to indicate this time; it left together with Vostok; with a convenient average speed; long out of range of the satellite. The only disadvantage: Paris Match must have reported the time wrong somehow. In either scenario, with of without the Vostok convoy, the BUK-loader was still accompanied by two (Vostok) cars during the entire trip. Even though Russian Trolls try to obscure and blur the events of that day and some things are not entirely clear, there is nothing really weird or odd here. If this story (a Russian BUK traveling from Donetsk to Snizhne to its launch-location) is invented and plugged by the Ukrainian SBU, the Russians can LEARN A LOT FROM THEM!!! Every twist the Russian version takes turns out to be easily dismissed as fake, propaganda and lies. This (Ukrainian) story nevertheless is consistent right from the beginning. It never changed. It is still the same as it was on July 17th 2014. And so far none of the zillion attempts to discredit it have succeeded. Only the details become much more clear over time, like in this blog. If this all is just a lie to blame Russia, the Ukrainian SBU can lie exponentially better than the Russian FSB! Disclaimer: this is a reconstruction. Most times remain estimates. When more accurate data would come available, adjustments may be necessary. Some details we may never know. The big picture is nevertheless very clear. If you see any errors or have additions or additional info, please contact me (best through twitter). Because the loader took a different route, the whole problem of 'narrowly escaping the 'Bellingcat' satellite image does not exist anymore. If another part of that satellite image would be bought, south of the current one, it almost certainly will show the loader.